The region's roads and bridges are slowly deteriorating under the weight of constant traffic and years of deferred maintenance. In the second installment of WTOP's Crumbling Capital series, Dave Dildine takes a look at few that exemplify the state of the area's infrastructure. This is the second story in WTOP’s series, Crumbling Capital, scrutinizing the decaying infrastructure in the D.C. region and what’s being done to fix it. WASHINGTON — A chunk of concrete falls off a crumbling bridge, slamming into a car windshield; there are weight limits on a major Potomac River crossing; and a busy commuter route is closed for months. These are just a few examples of the region’s disintegrating and underfunded transportation infrastructure. In early 2015, a loose chunk of concrete plummeted onto a woman’s car as she drove under the Capital Beltway. It broke loose from a decades-old bridge in Morningside, Maryland. Crews later sprayed an epoxy and erected a wooden platform under the Beltway to stabilize the loosening concrete while the Maryland State Highway Administration began a design process for a replacement bridge. The driver was not hurt, but the incident on Suitland Road was a jarring reminder that neglecting highway infrastructure can have serious, even deadly, consequences. A look at the region's crumbling roads and bridges. Locally and across the nation, tending to aging highways is costly and laborious work. There are about 20,000 bridges in the District, Maryland and Virginia. Between 3 percent and 5 percent of those bridges are in varying stages of decay and labeled structurally deficient, according to the Federal Highway Administration. State and federal officials insist that a bridge bearing the designation “structurally deficient” is not in danger of collapse. Still, the concrete incident in Maryland shows that crumbling infrastructure poses real safety risks to the traveling public. 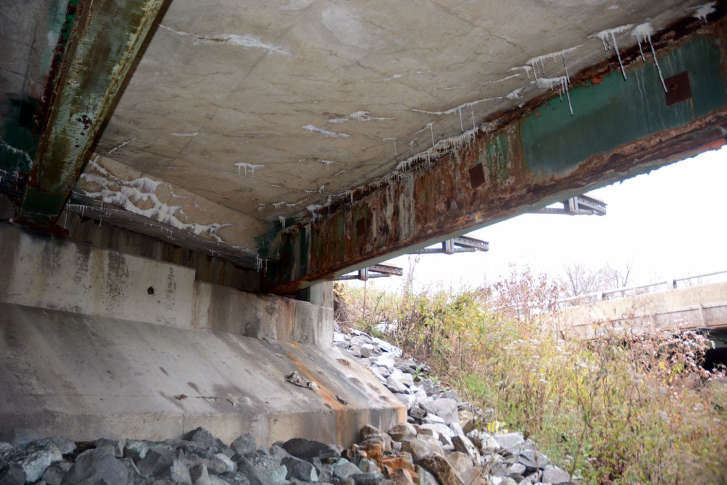 The Maryland State Highway Administration and the Virginia Department of Transportation routinely monitor bridge structures for new cracks, concrete deterioration, erosion and other deficiencies. Both states, along with the District Department of Transportation, employ inspectors trained and certified by the Federal Highway Administration. Bridges deemed structurally deficient are checked at least once a year. The Arlington Memorial Bridge is emblematic of the nation’s infrastructure challenges. Last year, the National Park Service warned that without funding for significant rehabilitation, the structure would need to be shut down by 2021 for safety reasons. Its facade appears elegant on the outside, but the bridge’s innards are withering away. An emergency 10-ton weight limit and round-the-clock lane closures were immediately put into effect after the discovery of severe steel corrosion around the unused draw span in 2015. Hari Aamidala is a bridge engineer for the American Society of Civil Engineers’ assessment of infrastructure in the District. “Over the years, deferred maintenance has definitely taken its toll on the structure. Since 2010, (the Park Service) has been hard at work repairing one thing after another that’s gone wrong. They’ve already spent more than $10 million to make quick fixes and the structure has a 10-ton load limit. But what it needs is a major rehabilitation, not quick fixes,” Aamidala said. He said that with only two levels of guaranteed infrastructure funding available, D.C. and Park Service officials face unique challenges compared to state agencies. “States use a mix of local, state and federal funds. D.C. is a little unique because it also has a number of bridges that are owned by the National Park Service … The Park Service is receiving $90 million from FASTLANE grants. But it still needs to secure matching funds from the Federal Lands Transportation Program, which would mean that Park Service transportation projects across the country will be deferred,” Aamidala said. The estimated cost of reviving Memorial Bridge is roughly equal to the Park Service’s road budget for the entire country. The agency has a $3 billion annual budget but only allocates about $268 million for transportation projects nationwide. The National Park Service and DDOT have been busy scrounging up funds to execute a $250 million rehabilitation of the structure. In early December, the Park Service and DDOT submitted an application for a second federal grant through the Department of Transportation, requesting an additional $60 million. Last August, the agency was awarded $90 million through the FASTLANE grant program, which funds critical freight and highway projects across the country. “If we are successful, that brings the investment through that program up to $150 million on Memorial Bridge, well on our way to the $250 million project,” Jenny Anzelmo-Sarles with the Park Service told WTOP. Anzelmo-Sarles said that without additional funding, short-term repairs to Memorial Bridge would fail to address the unused and heavy corroded center draw span. The repairs would therefore only extend the service life of the bridge to 2030. In that case, drivers would be on the hook for decades of lane closures, and taxpayers would be on the hook for ballooning construction costs down the road. More than 50,000 drivers travel Memorial Bridge daily and area officials are optimistic that additional funds will be secured. “I think everybody in this region sees the significance of this project not only in terms of Arlington Memorial Bridge being just that — a memorial — but as such a key link in the area’s transportation infrastructure,” Anzelmo-Sarles said. While the fate of some projects remains murky, other projects are in full swing. Portions of Beach Drive will be closed over the next three years for pavement reconstruction, storm drain replacement and rehabilitation of six bridges above Rock Creek Park. Standing next to the Beach Drive work zone in Rock Creek Park, Anzelmo-Sarles mused about a common lament from drivers during the winter months: potholes. “You see the most persistent potholes on roads like Beach Drive, like Piney Branch Parkway, that are well beyond their service life. Throughout the region, it’s symptomatic of many roadways in need of bigger repairs,” she said. The rebuilding of the urban scenic byway was made possible through Park Service allocations of the Federal Lands Transportation Program. The total cost of the project will likely exceed $30 million.